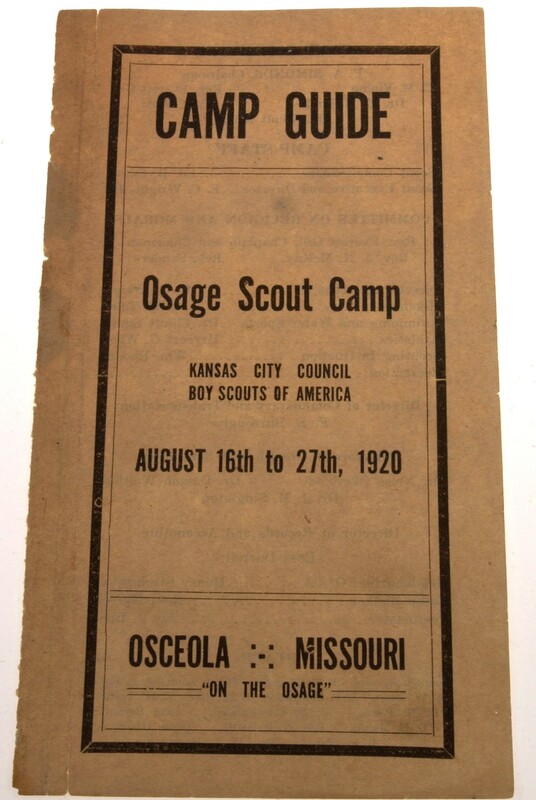 This week I’ve got some great images of old Camp Guides used to provide information about the summer camp experience at Osage Scout Camp (1920), Ginger Blue Scout Camp (1921), and Camp Dan Sayre (1923). 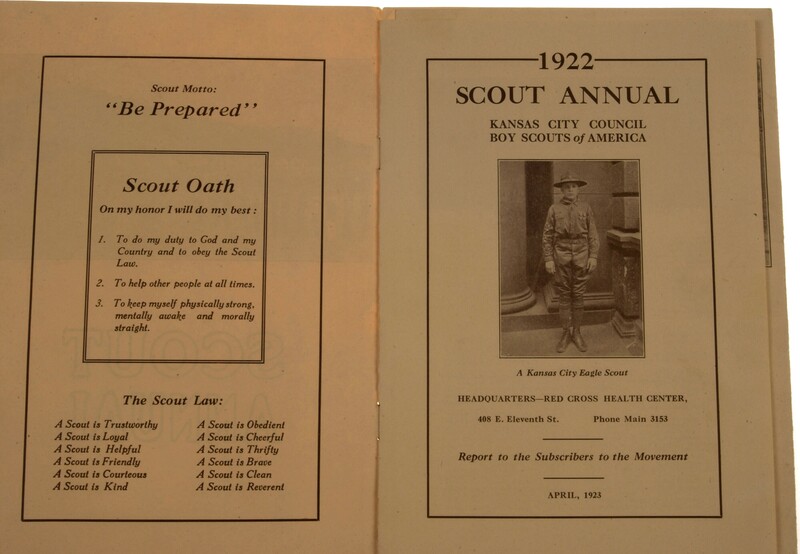 Additionally, I’ve included a 1922 Annual Report from the Kansas City Council with an image of an early Eagle Scout from the Kansas City area. 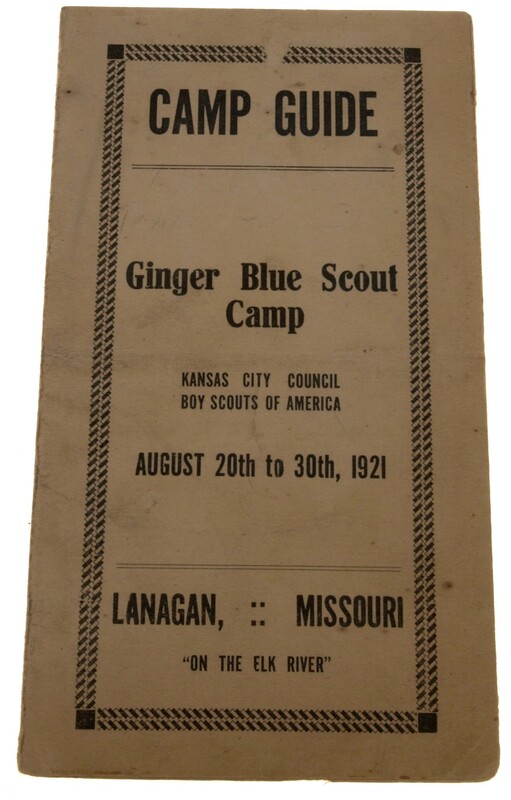 For more information about early camp experiences for Kansas City Boy Scouts, make sure to check out Andy Dubill’s book titled, “IN THE WOODS.” He’s also written mutiple articles on the subject for the International Scouting Collectors Association Journal. Thanks Jody T for the images. There were some great K.C. Area items on eBay last week. A source tells me that these items were part of an estate located near 95th and Mission. The seller has items from a father and son who were both involved in Boy Scouts in their youth. There are quite a few paper items connected to these two Scouts on eBay currently. Here’s a quick rundown of the two highlights from last week…if you click on the photos below, it will bring up a PDF of the auction listing with pictures. The first auction to go was a big one…the lot included 12 patches from the 1920s which included some decent non-KC area items: a patrol leader patch with felt bars, an early star badge, Troop 10 felt numeral, and an early version of Mining Merit Badge. The more exciting items were the Camp Dan Sayre (used by Kansas City Council in the early 1920s, located near Noel, Missouri) felts. These included: the 1928 and 1929 camper felts, a 1929 Honor Troop felt. Also, the lot included a 1943 Camp Osceola triangle. For more images of Osceola/Dan Sayre felts click here. The other interesting items were the four felt “10” diamonds. I have not seen those before, but my guess is that they have something to do with Troop 10. Bidding got pretty heated towards the end of the auction, with the final bidding going over $2,500! The second auction included a nice false merit badge sleeve. These were used in the 1920s as an alternative to sewing the merit badges directly to the sleeve. The sleeve includes 33 merit badges (I am not a merit badge collector, but you can read up on them here ). To me, the interesting items are the “4M” felts (one from 1924 and one from 1925). 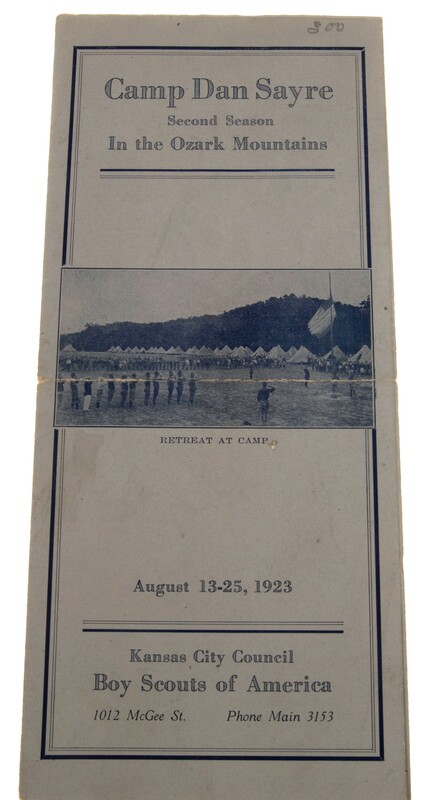 4M (Muscles, Morals, Mind and Manhood) was a camp honor program used at both the Elk Springs camp used by Kansas City area scouts dating back to at least 1915 and also used at Camp Dan Sayre through most of the 1920s. Here is a quick summary on 4M — interestingly, 1924 4M patch on that link is green, rather than blue… The sleeve also includes two additional patches that haven’t seen before…the felt circles at the top with “E 21” and “E 22″…they are similar to the 4M patches and probably date from 1921 and 1922, respectively, but there’s not much else to go on…again, click on the images to load a PDF of the auction listing. It is great to see these items come up on eBay…they also introduce new questions to be answered…I take it they didn’t blog about their patches back in the 1920s? As always, if you have any information or something similar to these items, please drop me a line.